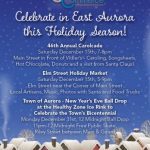 East Aurora to be the Location for the Taping of a New Christmas Film! Work Force Development Panel to Discuss Career Opportunities! Visit EA This Christmas Season for These Great Events! Getting the Most From Your Chamber Membership! We Invite You to Join Us to Learn How to Utilize Your Membership to the Fullest! POTTER RISK MANAGEMENT OF WNY, INC.